Since alcohol was first produced for human consumption, brewers and distillers have known that properly aging spirits can enhance their quality considerably. When you buy a wooden whiskey barrel from Brew Naturally and Deep South Barrels, you'll feel this history immediately. We handcraft our products using 100% domestically sourced American white oak. All barrels are built by our expert cooper in the traditional style - without nails, glue or other modern production techniques. If you're ready to get aging liquor at home, do it right the first time. Deep South Barrels products deliver the quality you need for a superior product, time after time. Our products are tools for aging spirits first and foremost, but they're also an attractive addition to any home bar. 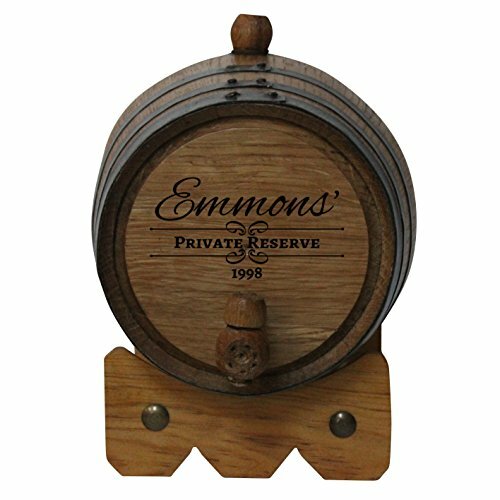 These barrels can be laser engraved with your monogram initials or a text and logo combination of your choice from the options listed when you select customize at checkout. Enjoy! HIGHEST QUALITY CRAFTSMANSHIP - Handcrafted, finished on the outside, with black steel bands. Just like full size barrels, our barrels are held together by pressure of the wood and the metal bands surrounding the barrel. Please follow the instructions for curing your barrel, and enjoy! SATISFACTION GUARANTEE - Our barrels are handcrafted by a cooper (barrel maker) and then cured (sealed) the first time by you, the user. WE OFFER THE ONLY 2-YEAR WARRANTY IN THE INDUSTRY. Please cure your barrel within the first 90 days and keep hydrated, your barrel is covered if you have any issues please contact us, we are always available and happy to help! If you have any questions about this product by Deep South Barrels, contact us by completing and submitting the form below. If you are looking for a specif part number, please include it with your message.